It's for silk (and similar) jerseys, which I've never sewn with before … I understand silk jersey is a dream to wear, but how is it to SEW with? Seems as if it would be slippery to me. Oh, in other Duro news, reader Lucette has asked that if you've made a Duro and have pics, you upload them to Flickr (tagged "Duro") as inspiration for others — I think that's a great idea! Erin, you can always use your handy-dandy can of Sullivan’s Fabric Stabilizer to tame any slippery fabric. If anyone’s looking for silk jersey, I just got a batch of samples from Thai Silks that are delicious. It’s not something you see all that often, but looks glorious (if maybe clingy) to wear. A silky lining may be called for to make it skim the body instead of stick. Question to ‘the sewist’ — does fabric stabilizer work on silk? I’ve seen the wash-off kind, but is there one you can use on non washable fabrics? Never thought to use it before, but will be going to my local craft store to find out if they have some. Thank you for the tip! Oh oh oh! Why have I not stumbled across HotPatterns yet? Has anyone sewed from them? Comments? Thanks for turning me on to them, Erin. Mmmm. I love this variant–especially the princess seamed bodice. A vast improvement over the rather blousy version in most patterns. And with that band around the neckline, it’s easy enough to make it a little less gaping. Also: Those Shoes! I love T-straps. Perhaps durodress or duro_dress might make a better tag? A cursory test of “duro” by itself reveals an extensive tour of a certain canyon in the panhandle of Texas. There are many Duros (photos and reviews) posted on patternreview.com You’ll need to know the pattern numbers to find them. Or a tag search on Duro brings up a few. I don’t find knits that difficult to sew, even without an overlocker. Then again, my Janome has several knit-stitch options. But I wouldn’t do your first knit-dress project with silk jersey. Try a less expensive knit like viscose or a rayon blend first. Thanks so much for this pattern! I was just thinking to myself, “Grumble grumble…bought dress length of gorgeous heavy viscose knit today…wants to be a fairly plain below-knee dress for winter…stupid pattern web sites…maybe Dress a Day can help?” And you did! This is so neat just yesterday I was thinking, ‘Oh, I miss the Duros so much from Erin’s site, and I still love Duros, and some people think they’re pass now, and I don’t care, I still love them!’And today, here you are, Erin, posting this great new Duro-ish dress from HotPatterns, and saying that you still love Duros, and here are all these other people on your blog commenting that they still love them! 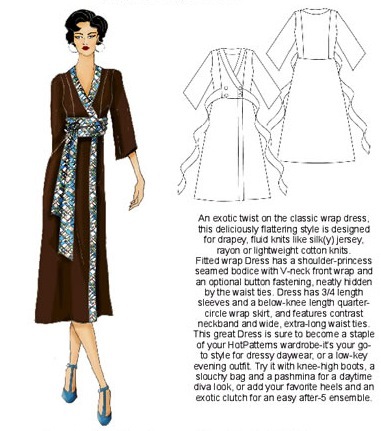 To Sara Jane, have a look at http://www.patternreview.com for reviews on Hot Patterns, plenty there. How kind of you, Erin, to offer to explain the last paragraph!! I am semi-literate in blogese and am an eager learner, but can’t find out WHERE The Directions are. So please, do explain. What are the chances? I’ve been awol from this blog for months and the moment I decide to tune back in, there’s a DURO post. If that isn’t a sign from above that I should go back to reading ADAD regularly, I don’t know what is! More than a duro, this dress seems to be a “Kara”, as in Kara Janx, one of the near-finalists in “Project Runway” a couple years ago. Remember that kimono-y dress she put together? I think this is pretty close to being a knock off of that. But with better sleeves, and princess seaming that lends itself to easy bust alteration. So it’s a knock off I completely support! Thanks for letting us know about it, Erin!